December | 2010 | Renowrites blog! I’m writing this entry at SFO airport on an iPhone using the WordPress app. Pretty cool, eh? Check out the SFO fog that has all inbound flights grounded until further notice. My kids are having fun running all over the terminal and I get to play with iPhone apps while they’re eating lunch. We spent about $50 already on airport food, which makes me wonder if this flight delayed stuff is a conspiracy to have passengers contribute to San Francisco’s dwindling budget. The holidays means it’s been a busy and fun time. One of my 2011 resolutions is to write in my blog at least once a week. Can it happen? Sure it can. It’s all up to me. Any readers (are there any?) will hopefully be able to see this blog updated more regularly. The holidays has me gluttoning myself with prime rib, pancit, pinakbet, sinigang, adobo, lumpia and lechon. Probably not the most healthy diet, but distinctly Filipino in nature. I wouldn’t have it any other way. This is why I officiate high school sports. To stay in shape for moments like the holidays that I can share with family and friends…and eat guilt-free! Looks like 2011 will be the year my first novel, To Keep A Promise, will be published. I submitted to a new publisher that will focus on releasing Asian American fiction, and they accepted! The preliminary release date is Filipino American month – October 2011! There will be a minimal print run, but will be available digitally for the ipad, Nook and any other e-reader out there. If it does well, then more investment in the print version will be made. The release may get pushed up, but need time to get the review copies out there. In all honesty, I’m not sure what to expect. All I know is that like any other debut author, I’m hoping for the best. Happy holidays everyone! More to come on the novel! In my opinion, the Manny Pacquiao victory over Margarito last month on November 13, 2010, was monumental, not only for boxing, but specifically for the Philippines. Before you start telling me I’m looking at this too deeply, le’s look at this from a historical perspective to understand the significance of Manny Pacquiao’s actions during this fight. Since the Portuguese explorer Magellan (representing King Phillip of Spain) landed on Mactan Island in 1592, Filipinos have been a conquered people. Christianity quickly spread throughout the islands during Spanish rule, and many of the pre-Spanish cultural icons of the local Filipinos were eradicated. Spanish lords ruled the barangays for three hundred years until 1898, when the little advertised Spanish-American War made the Philippines a U.S. colony (It’s interesting that the U.S. education system only mentions this war as a footnote, but upon further research, this war had a dramatic effect on Filipino and American life forever). For the last 110 years, the United States presence has changed the Filipino psyche considerably. How? For one, English became the language taught in Filipino schools. Before this, Filipinos learned Latin and Spanish in school, while speaking their native dialect only at home. As a U.S. colony, English became the language of the educated. Filipinos began immigrating to the U.S., many of them landing in Alaska, Hawaii and West Coast to work the canneries and asparagus fields. Throughout California, Filipinos were regulated to living in less than desireable conditions and were called “brown monkeys” up throughout the Great Depression. Filipinos were considered second-class citizens. Once MacArthur vowed “he shall return” in World War II, the American perception of Filipinos began to change. Filipinos and Americans allied to defeat the Japanese. Since then, Filipino immigration to the U.S. has skyrocketed. Generations of Filipinos since have dreamed of having a better life in America, a mentality further spurred by the American dream throughout the years. It didn’t help that the Philippines government became inundated with corruption with the Ferdinand Marcos era of rule, which many Filipinos escaped by immigrating to other countries. 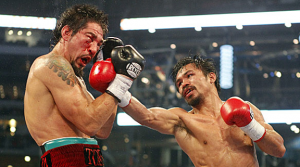 Fast Forward to the Pacquiao – Margarito fight on November 13, 2010. Filipinos around the world have stood behind Manny because he’s the boxer that exuded Filipino national pride. Filipinos and Fil-Ams drop their generational and cultural biases towards each other — we are all for one when it comes to Manny! So as I watched Manny let up in the 12th Round against a badly beaten Mexican warrior, I couldn’t help but love Manny not because he’s Filipino, but because of his sympathetic heart. He didn’t want to knockout Margarito in the 12th Round. He was genuinely concerned for his opponent’s well-being. When was the last time you heard of a boxing champ not going for the kill in that situation? In the post-fight interview, Manny repeated several times in broken English that “he just wants to make people happy” and that he’s a “public servant”, to serve the Filipino people. Imagine that. A boxer from the streets of the Philippines, a reflection of what the Filipino people strive to be in today’s world. Manny depicts the ideal psyche of the Filipino people — abolish corruption, be honest, respect others regardless if they speak English well or not, regardless if they speak a Filipino dialect or not. As our history proves, from the Spanish to the U.S. occupation of the Philippines, our community is continually evolving. Today’s Filipino family is diverse; Tagalogs, Visayans, Illocanos, mestizos still striving to escape the economic turmoil of the mother land, while maintaining good lives in our adopted countries. Many of us are Americans with Filipino blood looking for a connection back to the Philippines, but unable to determine how to invest back into the Philippines. I am a kid who grew up in the States, but hopes to give something back to the country that gave birth to my parents. And then Manny Pacquiao jumps on the scene, and I see a Filipino man break all the barriers that many of us wondered would ever be conquered. Is it possible that even with all of our generational differences and language barriers within the Filipino population, we can all come together for the common good? Thank you Manny for showing that a Filipino can see the big picture. And with Manny Pacquiao being a Philippine Congressman, this perspective bodes well for the future of the mother land, as long as other government leaders can do the same.